I remember trying Pozolé for the first in college after a night of binge drinking. 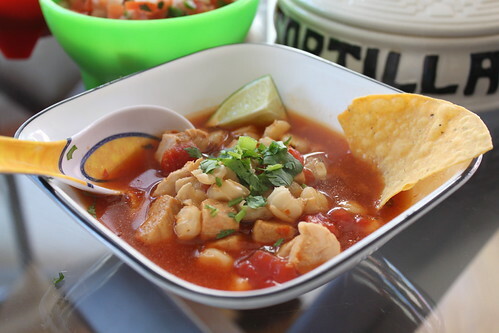 My buddy Ben told me that Pozolé and Menudo were perfect soups to cure hangovers — kind of like Pho. We went to the Taqueria by our apartment and had a nice big bowl of Pozolé and… a Corona. It was very delicious! The Pozolé helped with the hangover, but that wasn’t the main reason why I liked it so much. 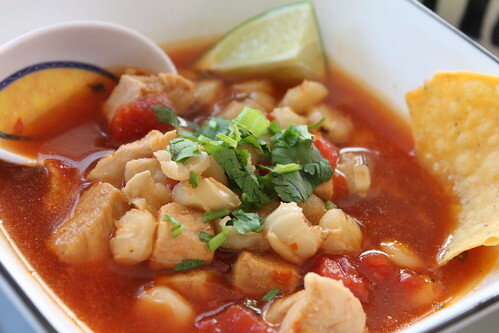 I enjoyed the interesting texture of the hominy, tenderness of the pork and spiciness of the red chiles in the soup. It was just different from other soups I’ve tasted. For the past few months, I’ve been thinking about the Pozolé I had in college and decided to make it since I don’t see it available at the Mexican Restaurants I go to. I researched a few recipes online and found that the Pozolé recipe from the Epicurious Website had all the flavors I wanted, but I added diced tomatoes for add more texture to the soup and enhance the flavor. Rinse hominy over cold water and strain. 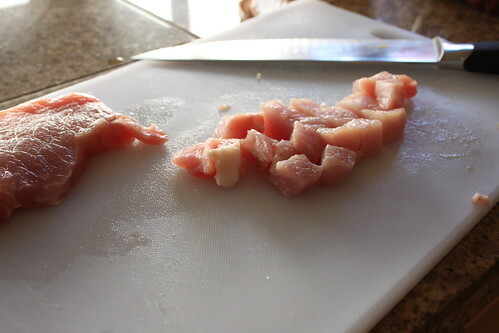 Cut pork into bite sized cubes and slice garlic thinly and add to pot. Add 12 cups of water and 4 cups of chicken broth to the pot and bring to a boil. Once soup boils for about 5 minutes, turn heat down to simmer. Skim the impurities and foam that floats to the top of the pot. Add crushed Mexican oregano, 1 tablespoon salt, and diced tomatoes to the pot and allow soup to simmer for about 1 1/2 hours. Remove stems from dried red chiles and transfer to a bowl. 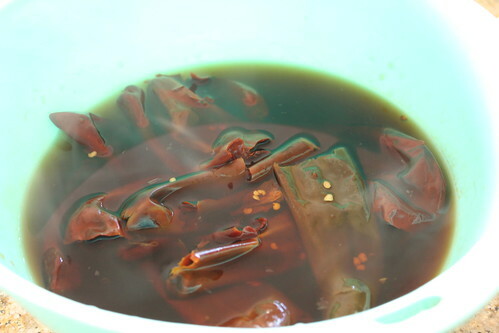 Pour 1 1/2 cups of boiling water into bowl with dried red chiles and occasionally stirring for at least 30 minutes. 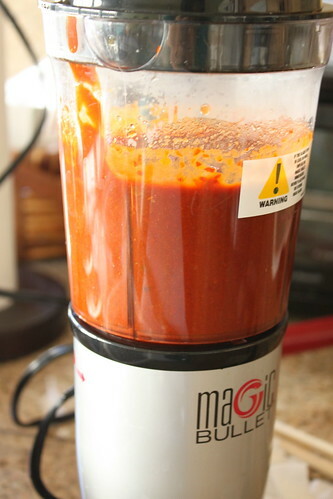 Add re-hydrated red chiles, onion, 3 cloves of garlic, 2 teaspoons of salt, and water into blender and puree until smooth. 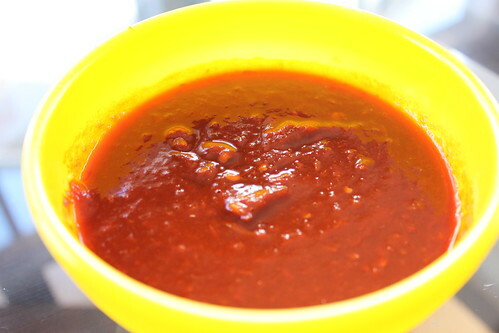 After 1 1/2 hours, add hominy and red chile sauce to the pot and let simmer for another 30+ minutes. At this time, you can add more salt if desired. Serve with tortillas or tortilla chips and any other toppings/condiments you like.